Copyright 2009 Human Kinetics, Inc.
PURPOSE: To monitor the hydration, core temperature, and speed (pace) of a triathlete performing an Ironman triathlon. METHODS: A 35-year-old experienced male triathlete participated in the Western Australian Ironman triathlon on December 1, 2006. The participant was monitored for blood Na(+) concentration before the race (PRE), at the transitions (T1 and T2), halfway through the run (R21), and after the race (POST; 2hPOST). Core body temperature (T(c); pill telemetry) was recorded continuously, and running speed (s3 stride sensor) was measured during the run. RESULTS: The participant completed the race in 11 h 38 min, in hot conditions (26.6 +/- 5.8 degrees C; 42 +/- 19% rel. humidity). His T(c) increased from 37.0 to 38.6 degrees C during the 57-min swim, and averaged 38.4 degrees C during the 335-min bike (33.5 km x h(-1)). After running at 12.4 km x h(-1) for 50 min in the heat (33.1 degrees C), T(c) increased to 39.4 degrees C, before slowing to 10.0 km x h(-1) for 20 min. T(c) decreased to 38.9 degrees C until he experienced severe leg cramps, after which speed diminished to 6 km x h(-1) and T(c) fell to 38.0 degrees C. The athlete's blood Na(+) was constant from PRE to T2 (139-140 mEq x L(-1), but fell to 131 mEq x L(-1) at R21, 133 mEq x L(-1) at POST, and 128 mEq x L(-1) at 2hPOST. 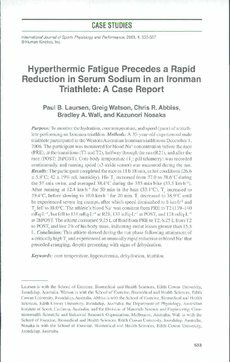 The athlete consumed 9.25 L of fluid from PRE to T2, 6.25 L from T2 to POST, and lost 2% of his body mass, indicating sweat losses greater than 15.5 L. CONCLUSION: This athlete slowed during the run phase following attainment of a critically high T(c) and experienced an unusually rapid reduction in blood Na(+) that preceded cramping, despite presenting with signs of dehydration.